Playing Card Tattoos - Playing cards are often featured in a multitude of tattoo designs. And the tattoo designs make full use of many of the symbols to be found in a deck of cards, all the way from the Ace of Spades, to the Queen of Hearts, to the 'wild' Joker. 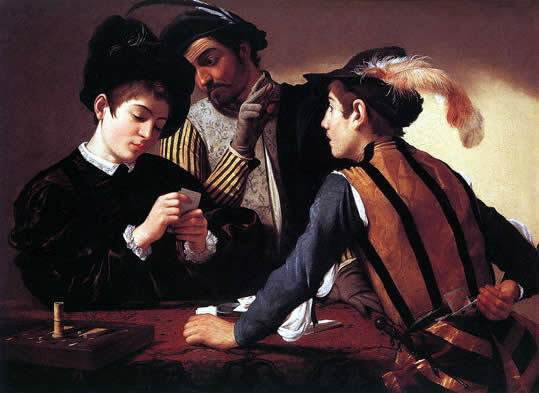 The modern pack of playing cards can be traced back to Medieval Europe, when cards were a dalliance of the rich. Printing techniques eventually made mass production possible so that playing cards became popular with common folk as well. A deck of cards consisted of 'royals' (also called 'court' cards), comprised of King, Queen and Knight (later termed 'Jack') - and number cards ranging from the 2 (deuce) to 10. The Ace, which derived from the Latin for the 'smallest coinage', took the lowest value of one. The four suits, Spades, Hearts, Diamonds and Clubs (originally cups, swords, coins and batons) came in two colours, red and black. In the 1500s, a pack became standardized to the 52 cards we have today. The Spade was said to be the knight's spearhead. In some early decks the leaf-like motif also stood for the aristocracy. The Heart was symbol of the church, the Diamond stood for the wealthy, while the Club was the clover or acorn, both representative of the peasant. In England, these suits have held fast for more than five hundred years. In France, the 'royals' -- the Kings and Courtiers -- were actually identified on the card as historical personages, often according to the whim of the card maker. The King of Spades was often identified as King David, and the Knave of Spades was Hector of Troy. Other contenders were Caesar as King of Diamonds, and Alexander as King of Clubs. The identity of the Queens included saints like Saint Joan, and Greek goddesses and various wives and consorts of monarchs. The Knaves included Greek heroes, Arthurian knights and aristocratic French noblemen. With the French Revolution at the end of the 18th century, the popularity of the aristocracy plunged and along with it the glitter on the royals crowns -- they became no-name royals. In the earliest card games, the King always took the highest value (10), and the Ace the lowest (1). But as early as the 14th century, the Ace could be played as the highest card, making the deuce the lowest. During the French Revolution, the game 'Ace High' became symbolic of the 'lowest classes rising above the aristocracy'. What is so special about the Ace of Spades? Depending upon where you live in the world, the different suits of cards have different rankings, but in nearly all instances Spades are the highest ranking suit, whether you are playing Poker, Bridge or a game of Chinese Big Two or Choi Dai Di. The suits may be ranked either by alternating colour, Diamonds (lowest), followed by Clubs, Hearts, and Spades (highest), or alphabetically, Clubs (lowest), followed by Diamonds, Hearts, and Spades (once again the highest). And as the Ace is the highest ranking card, hence the Ace of Spades is the single most powerful playing card in a deck of cards. The short-tempered Queen of Hearts was made famous in Lewis Carroll's Alice in Wonderland, reputed to be a caricature of Queen Victoria. "Off with their heads," shouted the Queen of Hearts as a solution to anyone who crossed her path. In the book, she is the symbol of the obstacles Alice will face on her journey through Wonderland. 'One Eyed Jack' refers to the Jack of Spades or the Jack of Hearts, both portrayed in profile with only one eye visible from that perspective. 'Joker's wild' or 'Deuces wild' is a designation by the dealer that Jokers or deuces (2s) may be played as any card the holder desires. Those most proud of their skills in card games, particularly in poker, tend to frown on the inclusion of the 'wild' card, relegating its use to amateurs. In fact, any card can be proclaimed wild before the cards are dealt and an agreement has been reached between all the players. There were times when a card player might be caught with a deck during a gambling prohibition. He might have defended himself by claiming the cards had religious, metaphysical, or astronomical significance, such as the four suits representing the four seasons, the 13 cards symbolizing the 13 phases of the moon, the 52 cards of the deck symbolizing the weeks of the year, etc. In fact, adding up the numerical value of each card - and adding 1 (for the joker) - you get the number of days in a year. Toss in the other joker and you have a leap year. What! Me gambling? Never!!! The Joker is actually a relative new-comer to the card pack, although it was familiar to users of the medieval Tarot deck as the Jester or Fool. There are two to the standard pack, one red, one black. It is commonly believed that the Joker was introduced by Mississippi riverboat gamblers in the 1860s to serve as an extra trump card. The red Joker outranks the black in games where comparative values matter. In poker, the Joker is wild, representing any card the holder desires. Wild Bill Hickok, historical gambler and gunslinger, died while staring at a fistful of playing cards. He was shot dead while playing poker in Deadwood, Dakota in 1876. The hand he was holding -- two pairs, black Aces and black eights - came to be known as the 'dead man's hand'. According to legend, the fifth card hadn't yet been dealt. Bill's hand can shows up as a favoured tattoo motif, often located on the calf. Playing card tattoo designs are often symbols or amulets of luck. And all of us could use a little good luck. 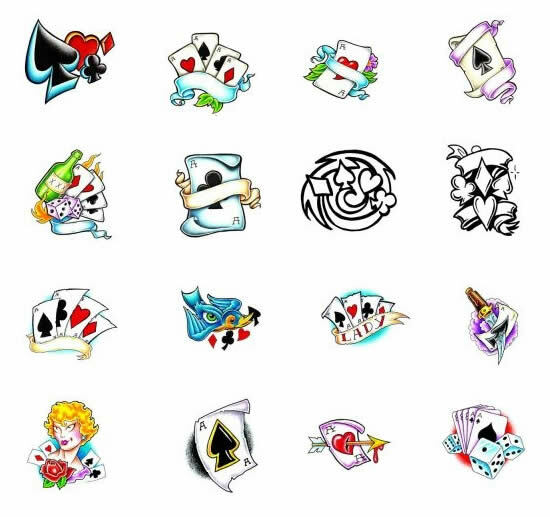 Playing card tattoo designs may feature a number of different cards, perhaps a winning Poker hand like four Aces or a Royal Flush or they may feature a single card which has special significance like the Queen of Hearts, Joker or Ace of Spades. Card games, by their very nature, tend to rely as much on luck as on the skill of the card player. Of course that has never stopped a daring few from trying to make a living as professional gamblers, also known as 'card sharps'. And judging from the growing popularity of games such as Poker, many of us identify with gamblers and the ability to make your own luck. Playing cards are also often featured in tattoo designs that warn of the perils of gambling, such as in 'Man's Ruin'. Man's Ruin designs feature the vices that can lean a man astray in life, such as women of easy virtue, alcohol, drugs, and gambling - which may be represented by billiard balls, pool cues, dice, playing cards and perhaps even a horseshoe as a symbol of betting on the horses at the track. As tattoo designs, playing cards are a metaphor for life. As players we can no more determine or predict the cards that will turn up in a deck of cards than we can predict the future in a capricious universe. Sometimes in life, as in games of chance, it is more important to be lucky than to be talented. Having a winning hand tattooed on your body may be just the luck you need to make the difference between winning and losing! 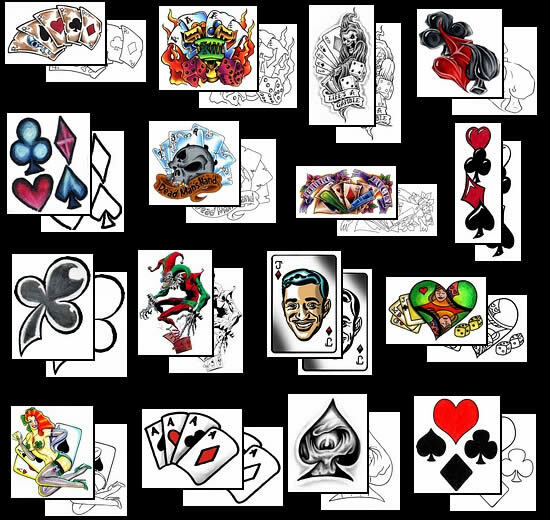 Choose your own playing card tattoo design from Tattoo-Art.com. Find and buy the playing cards tattoo design that is perfect for you.